Rice and grains are staple foods over much of the world. They are used in many different recipes, and can be prepared in numerous different ways. 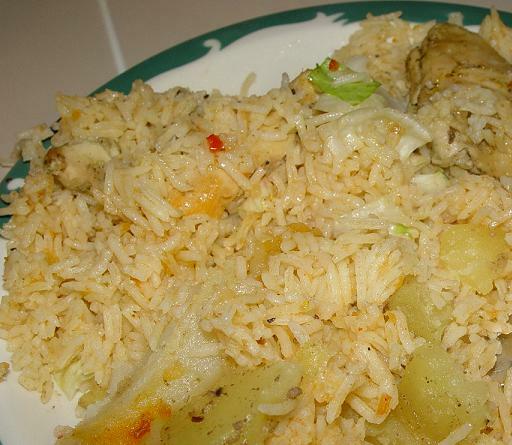 Barris iyo digaag suqar - This recipe from Somali cuisine is made from rice with stewed chicken and vegetables. Congee - This recipe is from Chinese cuisine, but similar recipes can also be found in a number of other Asian cuisines. Congee is rather like porridge, and can be made from rice, barley, cornmeal, millet or sorghum. 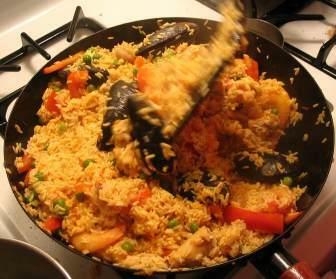 Paella - This dish from Spanish cuisine originates in Valencia. It is made using rice flavored with saffron and olive oil, and also contains meat, seafood, and vegetables. Rice pudding - This is a popular dessert in British cuisine which seems to inspired by Indian cuisine's kheer (another rice based dessert). Rice pudding can be eaten hot or cold, and made from fresh ingredients or bought ready-prepared in cans in most UK supermarkets. 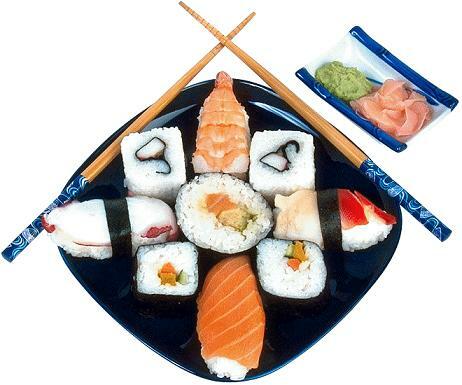 Sushi - This is one of the most famous dishes of Japanese cuisine. It is made from vinegared rice topped with fish, seafood, meat or vegetables. Many Westerners incorrectly think the word "sushi" refers to thin slices of raw fish - this is incorrect, the raw fish is known as "sashimi" and is just one of possible toppings for sushi. Zongzi - This is a Chinese recipe from glutinous rice with a filling. This is wrapped in bamboo leaves and then boiled or steamed.